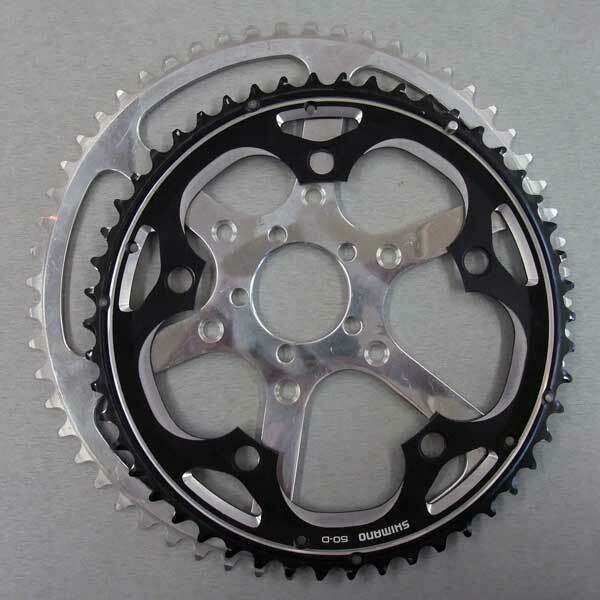 I recently spent a fair amount of time on the phone with someone convinced the only way he's going to go faster on his bike is with a bigger sprocket. He's currently got a 50 tooth up front, 11 tooth in the back. (Before going any further, the basics of gearing are that the larger the front chainring, the higher the gear. For the rear, the smaller it is, the higher.) To put that in perspective, he's already got a higher gear than the legendary Eddy Merckx had, probably the best bike racer who ever lived. And he was very, very fast! A "normal" bike comes with a high gear that's probably a 50 tooth chainring up front, combined with a 12 tooth sprocket in back. With a 700 by 25c tire (normal for a road bike), you would be going 26.2 mph at a leisurely cadence (number of times your crank is going around each minute) of 80rpm. A mere mortal cannot sustain that high a speed, regardless of gearing. A highly-trained professional cyclist can maintain 30 mph on a bicycle designed specifically for time trials (for about an hour, racing against the clock, without other people around), but for the rest of us, 22-24 mph is the best we can hope for over a distance of greater than a mile or so. Seriously. 24 mph (with that 50/12 combination) is only 73 rotations of the pedals per minute, well within the range attainable by virtually anybody, regardless of physical strength (73 rotations of the crank per minute that is; 24 mph is another thing entirely). Even at 60 rotations per minute, you're still doing 20 miles per hour, and of the many thousands of my customers, a relatively small number can probably maintain that speed for any distance. Will you go faster if you replace the stock chainring on your bike, like the 50t one shown here, with a larger chainring, like the 56t behind it? 99% of the time the answer is no, you will likely go slower. That example is for a 50 tooth front, 12 tooth rear sprocket. The gentleman in question already had an 11 tooth rear, so at 60 rpm he's going 21.5 mph. To get to 30 mph, he's only pedaling at 83 rpm. But the laws of physics won't allow him to get to 30 mph, unless he has a strong tailwind or is descending. And if descending, he's going to go even faster if he tucks in a bit and gets a bit aerodynamic; pedaling will actually slow him down, due to turbulence. But why not have that ultra-high-gear anyways? What's the harm? The human body is simply not made to produce optimal power at very low pedaling rotation speeds (rpm). You need more horsepower than you have to push a really high gear at low RPMs. A tandem, where you have the horsepower of two people pedaling, can often make use of higher gears. A normal person, even an abnormally-strong person, cannot. Let's talk first-person here. Me. I'm known to be a high-gear sort of guy. People make fun of me because I use higher gears than most others that I ride with. How high? My flat-land cadence is typically around 80 RPMs (it should be closer to 90). If I'm feeling good, I can do 21 mph using a 50 tooth chainring up front, with a 15 tooth rear. If I shift to a higher gear, I will not go faster! I will simply pedal more slowly and my speed will gradually drop as my legs become sluggish from trying to push too hard on the pedals. What about descending Skyline from Kings Mtn to Sky L'onda, where you can get to 40 miles per hour? My highest gear, a 50-tooth front/11-tooth rear, would have me pedaling at 112 RPMs to get to that speed. And yes, I can pedal that fast, if I want to. But I will go faster if I don't pedal! Pedaling creates choppy air that slows you down. The only exception to this is if you're drafting (following closely behind) a large truck, but even then you'll probably get sucked along behind it without having to pedal. So how high a high gear do you need? For most, a 50 tooth front, 13 tooth rear would manage everything needed. There might be a very rare time something taller would be useful, but not too often. At 90 RPMs, you'd be going 27.2 mph. Nearly every road bike (and most hybrids) have a higher gear than that though, typically with a 12-tooth in the back. That would give nearly 30 mph at 90 RPMs. You might never have occasion to use a higher gear. And if you've already got an 11-tooth in back (as many bikes come with stock), don't expect a receptive audience at your local bike shop as you're trying to explain your need for a bigger gear so you can go faster. Don't take my word for it. Read what Kevin Metcalfe, a top racer (if 10,000 people read this post, there might, maybe, be a single person faster than him), has to say about gearing. And a discussion in a triathlon group on the same subject. Thanks for listening- Mike Jacoubowsky, former racer, present-day bicycle retailer, long-time cyclist and more patient than I should be entertaining people who think they need higher gears.